Thermo Fisher Scientific in New Hampshire asked Ergotronix to come up with an ergonomic lift assist solution to retrieve, and install glass cutter tooling magazines into the bed of a Glass Slide Cutting Machine. The machine produces microscopic glass slides and covers. The company challenged Ergotronix to devise a method that would eliminate 100% lifting currently associated with the manual handling of the cutter slides. Previously, two operators had been injured using the current two-person lift method to manually retrieve the heavy and bulky cutting tools from the storage drawer, then walk them over and place them into the Glass Cutting machine bed by hand. During this operation the employees incurred excessive physical strain and physical injury. These special tools are extremely expensive diamond impregnated, precision set and calibrated cutters for their glass cutting operations. The precision cutters can be easily knocked out of alignment, or be seriously damaged, by even the slightest bang or knock during handling and installation. Thermo Fisher Scientific insisted that, a safer and foolproof method by devised to handle these cutters, without sacrificing production time or allocated capital expenditure budget. 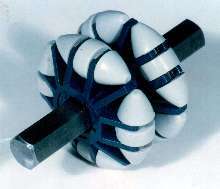 The issue was solved by integrating the Ergotronix Ergo Tranz, a manual compact transporter and lifting device, with a custom engineered end-effector into the CNC tool changeover process. Ergotronix developed a CNC tool holder tray that is removable from the existing CNC tool cart. Utilizing the Ergo Tranz lift and transporter, with a set of custom designed forks to disengage the newly designed tool holder tray from the tool cart and transport it to the CNC machine where it is then raised to the eight feet high tool holder magazine. In this new setup the tool holder tray is next to the CNC tool holder magazine and the operator is able to remain in a stationary position on the platform while removing all of the tools from the previous job at once, placing them into the empty tool holder tray, and then return the tool holder tray to the tool cart. The process is then repeated for the next job, all from the safety of the ground with the need to lift or carry the tools to the holder or up to the magazine storage area. Adjustable boom and hook replacing glass cutter tool tray to station cart. In the months that followed, the Thermo Fisher operators continue to be pleased with the ergonomic improvement gained by the utilization of the Ergo Tranz. They have also been very pleased with the ease of use, as well as reliability of the equipment. 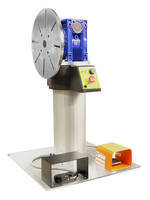 Rotary Work Positioner is suited for welding and assembly. Mobile Transporter/Lift features smart functionality. Medical Puller helps hospital workers position beds. 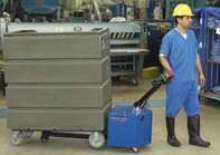 Cart Puller lessens employee strain and fatigue. 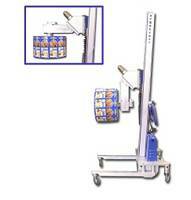 Conveyor Roller transfers packages in any direction. Trailer Mounted Lifts have self-leveling outriggers.